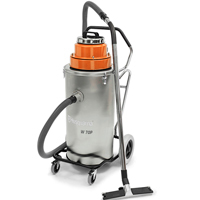 Renowned durability – Stainless steel container, crush-proof hose, cast aluminium swivel hose lock, galvanized steel dolly and steel clamps for tight air seal are details allowing for a long service life. Reliable overfill shut-off – The patented filter/float system provides maximum airflow and reliable wet shut-off in case of overfill. Extreme pumping pressure – The powerful evacuation pump is capable of pumping the slurry 9 meters vertically or 200 meters horizontally. 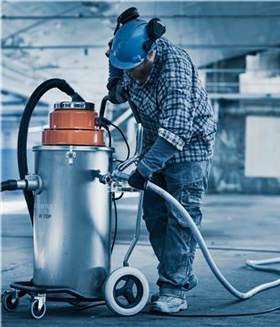 Multipurpose use – The versatile W-Line can deal with liquids such as concrete slurry, oils and machining coolants.